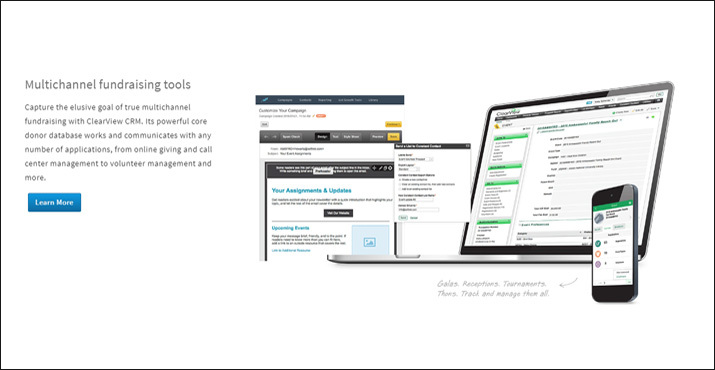 In the age of digital fundraising, having robust and flexible online donation tools is a must. When you enable your supporters to make contributions online, you’re opening up a world of donation opportunities for them through channels like online donation pages, mobile giving, peer-to-peer and crowdfunding platforms, and more. 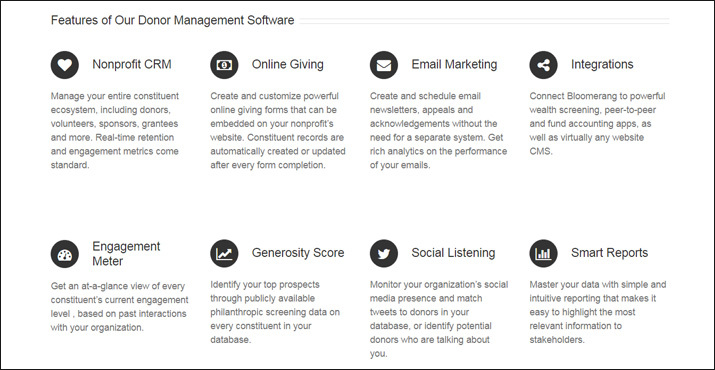 Convenient, fast, and secure, online donations are essential for the successful nonprofit. But in order to accept online gifts, you’ll need to select the right online donation tools. There are a number of viable options for online giving, but some providers stand out from the crowd. Here, we’ll go over the best online donation tools in detail to help you find the right fit for you. Let’s go through our favorites! If you’re a nonprofit looking to maximize your fundraising potential with online donation tools, look no further. Qgiv provides simple, powerful donation pages for nonprofit organizations. Through our platform, you’ll be able to customize your pages to match your website completely. When you have a professional, branded donation page, your donors will be more likely to trust that their payments are secure (and complete the donation process!). In addition to donation pages, Qgiv also offers a full set of fundraising products that push your fundraising to the next level. From peer-to-peer software to mobile giving, Qgiv can supply your organization with all the online donation tools you need to raise more money and engage donors in convenient, exciting ways. Because Qgiv is specifically designed for nonprofits, our products are tailored to meet your organization’s needs and assist you in every aspect of fundraising. Peer-to-peer pages and gamification tools. Mobile giving kiosks for on-site giving. In short, Qgiv has thought of almost everything to make sure your fundraising is simple, streamlined, and successful—from start to finish. QGiv’s price model is as straightforward as can be. Our online donation tools cost $49 per month, with a transaction fee of 3.95% + $.39 (merchant fees included). Additional products or features, such as mobile card readers or peer-to-peer software, can easily be added on for an additional fee. You can check out our full product set and prices right here. Qgiv’s products are the perfect online donation solution for nonprofit organizations. Learn more about our comprehensive product set and get started accepting online donations with Qgiv today! Harnessing the power of online giving and maximizing that potential, Double the Donation offers nonprofits matching gift tools. Double the Donation makes it to surpass your fundraising goals with matching gifts, which are corporate programs that allow for employers to match their employees’ donations to nonprofit organizations. Through this platform, you’ll be able collect extra donations with little extra effort! Double the Donation will even help you market matching gifts and send appropriate content to eligible donors to encourage them to submit their matching gift requests. 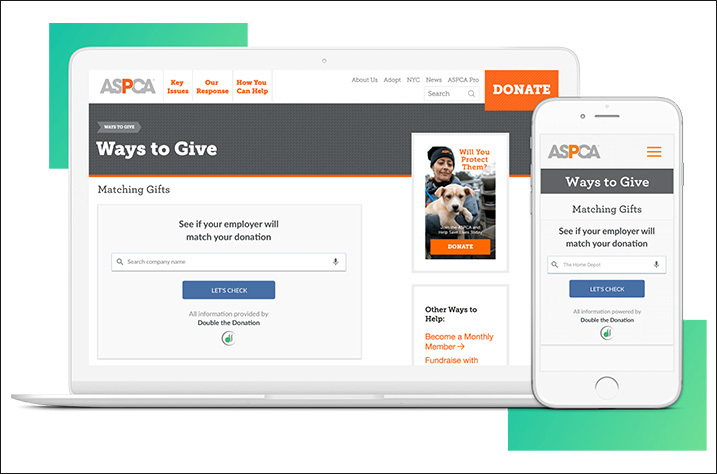 Double the Donation provides nonprofits with a widget that allows donors to search for their employer in a matching gift database and thus, determine their eligibility! Plus, this widget is embeddable into your other online donation tools like your donation forms and your website. Double the Donation’s basic plan runs at $299 a year and their premium plan runs at $499 a year. Double the Donation is an easy way to raise extra money for your cause. Learn more about matching gifts with Double the Donation today! 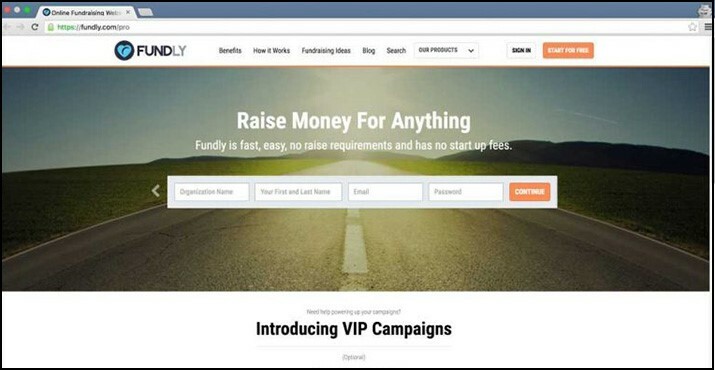 For user-friendly crowdfunding, Fundly is hard to beat. 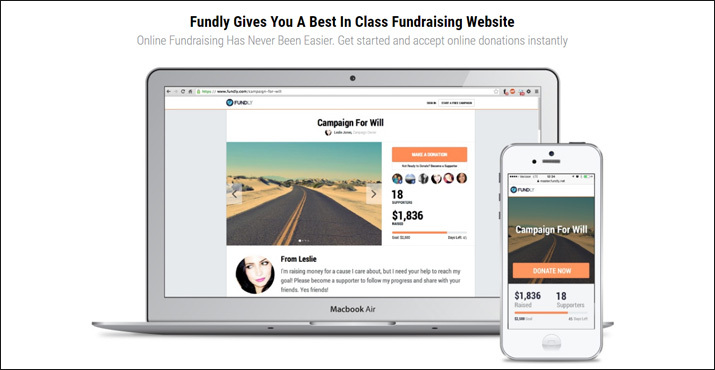 Anyone can use Fundly to fund personal projects or raise money for charitable causes. 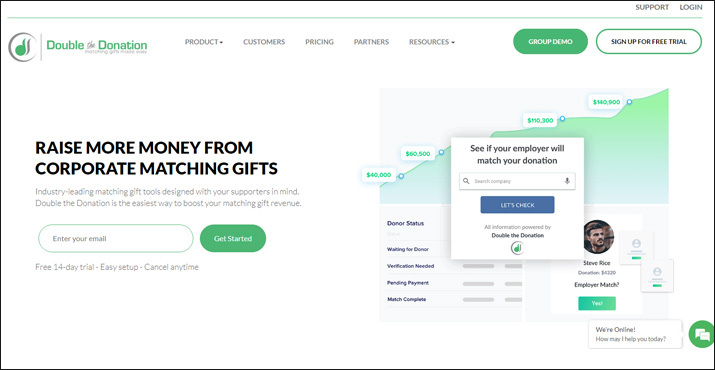 Fundly provides fundraisers with custom campaign pages, complete with space for your photos, videos, and even a crowdfunding blog to keep your supporters updated with your fundraising progress. You can easily spread the word about your campaign thanks to Fundly’s simple social tools, including social media integration and other fun, easy-to-use features. Plus, Fundly operates on a “Keep It All” fundraising model. That means you keep all the money you raise, no deadlines required. Fundly is dedicated to making sure your campaign is successful, so you don’t have to worry about the clock running out! Fundly understands that mobile capability is a huge aspect of online fundraising. Therefore, this online donation tool ensures that all campaign pages look stellar on small screens, including smartphones and tablets. Plus, you’ll have access to Fundly’s free crowdfunding app, where you can build and promote your page no matter where you are. If you choose to raise money with Fundly’s online donation tools, their team will do everything to ensure you meet your fundraising goals. Not only is their customer support team one of the best around, but they also offer a multitude of free resources, including ideas to raise even more during your campaign. There’s no initial cost to start your Fundly campaign. Fundly charges a 4.9% platform fee in addition to a payment processing fee of 2.9% + $.30 per transaction. Fundly is one of the go-to online donation tools for individuals. To learn more about their awesome features and get started with your own campaign, check out Fundly today! If your small or mid-size nonprofit is looking for a way to boost efficiency and fundraising potential all around, Bloomerang is your best bet! As a lightweight CRM platform, Bloomerang contains a full suite of tools that can seriously boost both your campaigns and your internal operations. Powerful database tools plus online donation tools and communications features help you get everything done in one place. 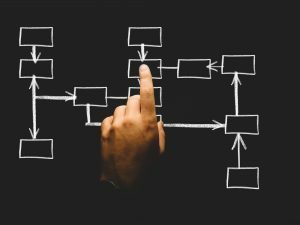 Best of all, you can pull directly from your data as you plan and conduct your new projects, leading to smarter, more adaptive decision-making. Focused on helping nonprofits increase donor engagement and retention, Bloomerang is the best CRM software choice for organizations that don’t need a huge, enterprise-level solution. Bloomerang is such a powerful tool for nonprofit organizations because all of its tools work together perfectly to streamline your operations and fundraising. Its CRM features include smart reporting, interactive dashboards, and engagement trackers to keep your database tidy and useful. 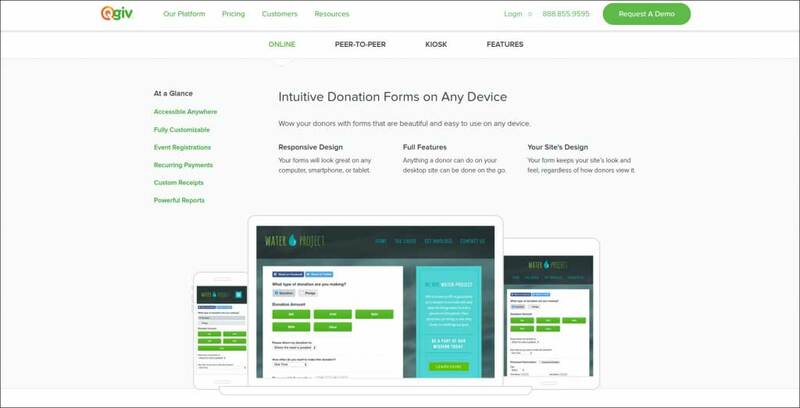 Online donation tools like an email design platform, website integrations, and social media listening work alongside customized online giving forms. Accept donations and track all your important data in one place! Unlike many similar software solutions targeted towards large organizations, Bloomerang offers a simple and straightforward pricing structure. Their first pricing level starts at just $99/month and allows you to manage up to 1,000 donor records. Never underestimate the power of keeping your data close to your fundraising tools! 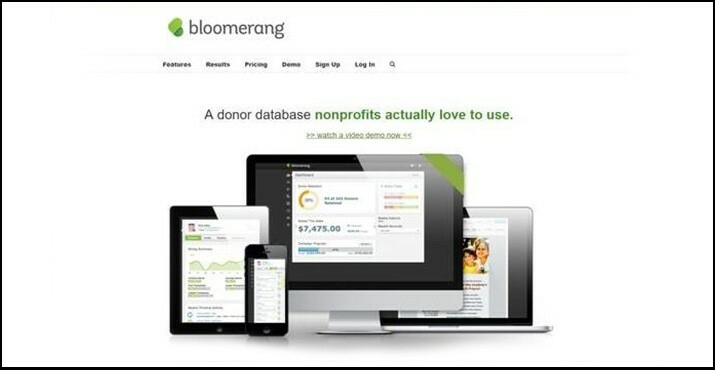 Bloomerang is the perfect online donation tool to keep you organized and boost campaign results organically. 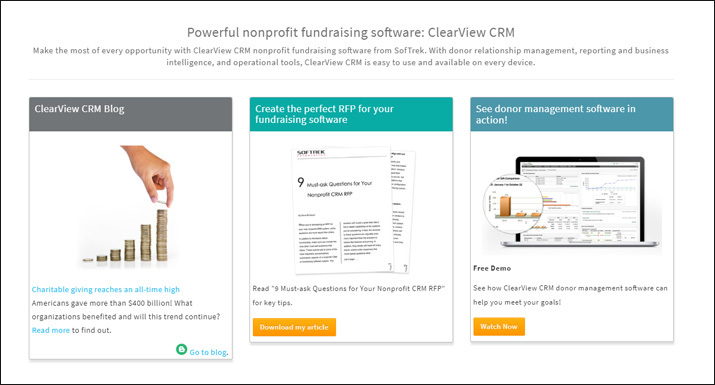 ClearView CRM offers a comprehensive online donation and multi-channel fundraising software for larger nonprofits. 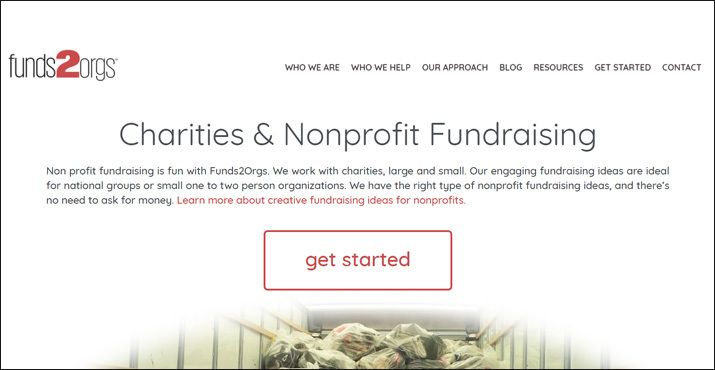 With this software, your nonprofit has a single database that contains everything from fundraising campaign data to donor and prospect profiles. The customizable dashboard is perfect for fundraising campaigns that have multiple departments working towards the same goal – all data is synced and updated across the platform so that everyone has the same view of donations. ClearView CRM creates consistency and predictability across any fundraisers by prompting fundraisers to follow up when appropriate and displaying all previous solicitations to donors. Beyond their online donation software, ClearView CRM is a robust donor database, with data management tools, and a business intelligence and reporting tool. The price tag for ClearView CRM depends on your nonprofit’s needs, so contact the SofTrek team for a quote and more information. 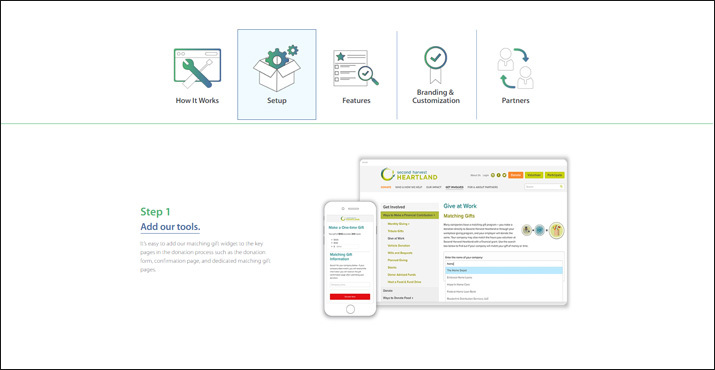 If your enterprise nonprofit is looking for an online donation tool that also has all the functionality of a robust donor management platform and event planning system rolled into one, choose ClearView CRM to maximize the impact of your online fundraising. 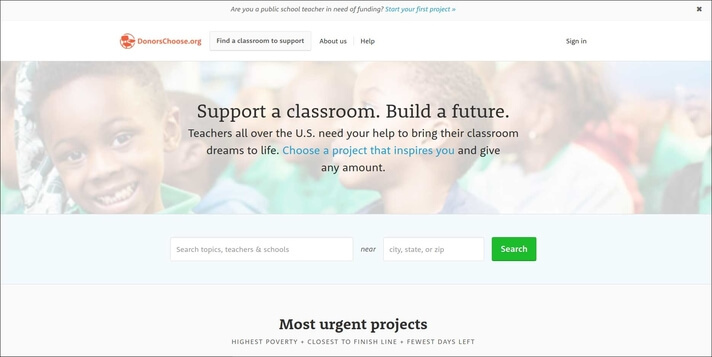 On a mission to “bring the public to public schools,” DonorsChoose enables teachers to request funding for classroom supplies, technology, or other needed items and experiences for their students. Educators can start projects on this online donation tool by setting up custom campaign pages, sharing their stories, posting photos and videos, and describing their needs in detail, including number of students affected and the school’s level of poverty. 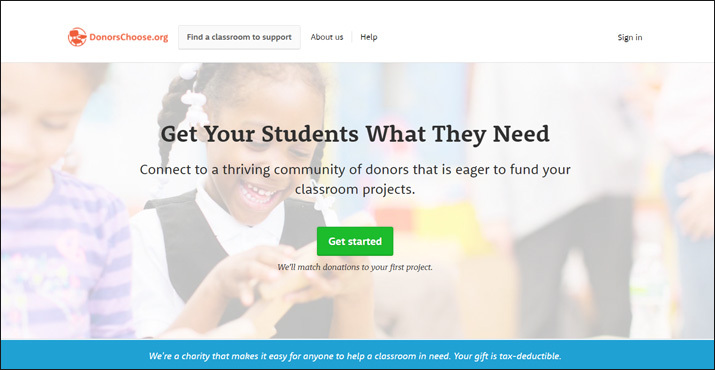 Because this online donation platform is designed with classrooms in mind, project-starters must request specific items and costs rather than setting a general goal. When supporters donate, they can choose exactly where their money goes. And, because DonorsChoose takes care of all purchasing and shipping, there’s no question that classrooms get exactly what they need. DonorsChoose has established a tight-knit community of educators and their students, and their team is seriously dedicated to each project’s success. Every project is vetted and screened to ensure that the community standards are met. When you post your project, you’ll have up to 4 months to meet your fundraising goals. If you don’t meet this deadline, the contributions you’ve received can be redirected to a future campaign. If you do meet your goals, DonorsChoose will handle all purchases and make sure you get your items within 3 weeks of completing your goal! This online donation tool is always 100% free for educators. As a nonprofit themselves, DonorsChoose funds their product fulfillment and shipping (as well as other operational fees) through partnerships and donations. If you’re a public school teacher hoping to add value to your classroom, DonorsChoose could be the online donation tool to help you meet those goals. Learn how to apply for a project with DonorsChoose! One of the most popular crowdfunding services for creative projects, Kickstarter enables fundraisers to accept online donations from anyone in the world. 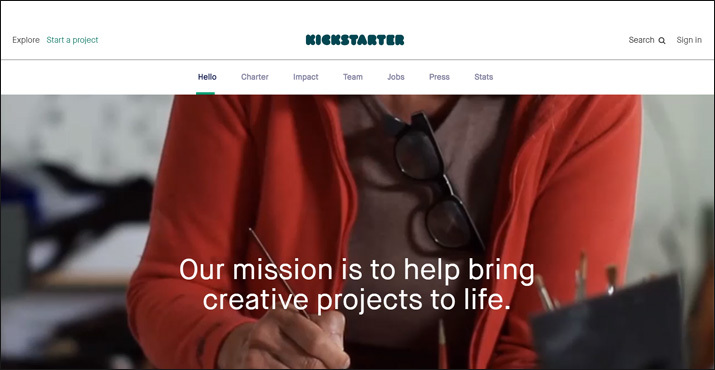 Kickstarter provides personalized campaign pages to help users crowdfund their creative or entrepreneurial projects. You can include photos and videos showcasing your project, as well as write a descriptive campaign story to persuade others to pitch in. 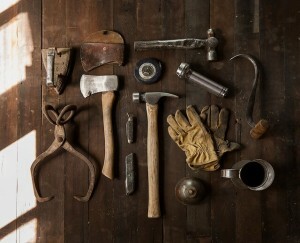 Then, promote your project across your networks using Kickstarter’s social media tools. One of Kickstarter’s defining features is its “All or Nothing” fundraising model. If fundraisers don’t meet their goals, they won’t receive any funding. While this model can be intimidating, it can also serve as a great motivator to quickly meet goals within a time crunch. Kickstarter makes it easy to provide incentives for donors who use this online donation tool. Fundraisers can create reward opportunities that vary with every level of support so that supporters get something out of participating, too. This platform is a great place to get creative! Because this online donation tool is intended for creative projects, fundraisers also receive the benefit of sharing their completed projects with a thriving community of fundraisers and donors. Filmmakers, musicians, tech-innovators, and designers can come together to create, promote, and fund projects, bringing their ideas to life. For completed projects, Kickstarter charges a 5% platform fee as well as a payment processing fee of 3.% + $.20 per transaction. Kickstarter has funded tens of thousands of creative projects through the power of online networks. For more information, read more about Kickstarter campaigns. By combining online giving and the classic t-shirt fundraiser, Bonfire adds a creative twist to online fundraising. 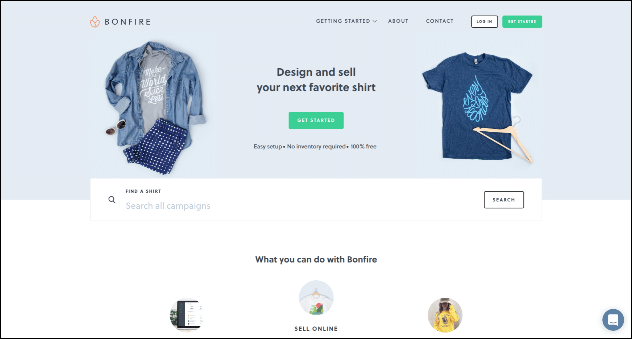 Bonfire makes it easy to collect online donations by selling custom t-shirts. 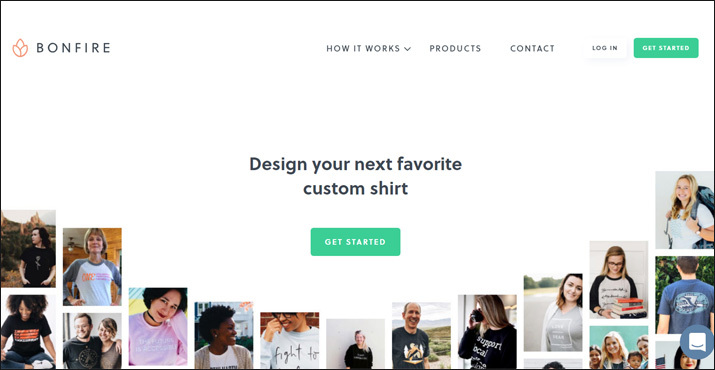 Through this platform, you’ll be able to create products using their simple design tool. Your shirts can be as unique as you’d like to promote your event, cause, or organization. With plenty of products to choose from and expert staff on hand to walk you through the process, your supporters are guaranteed to walk away with apparel they’ll love to wear for years to come. Bonfire offers a diverse array of apparel options including t-shirts, tank tops, sweatshirts, and more! One feature of this online donation tool that we love is they don’t charge until you reach your profit threshold. This means that if a campaign fails to hit its stride, you can head back the the drawing board without worry. Because this online donation tool understands that t-shirts are just the start of your fundraising efforts, you can choose to accept additional donations on top of your product sales. When you give your donors more ways to donate, they’re sure to give even more! Individuals, groups, and organizations can all start their Bonfire campaign with no upfront cost. Bonfire only charges for additional donations made at checkout. They’ll deduct an 8% fee for credit card and other administrative expenses. They offer a flat shipping rate of $5 on all U.S. orders! Bonfire is a creative, fun online donation tool to use to raise money for your project or cause. Learn more about starting a Bonfire campaign today! 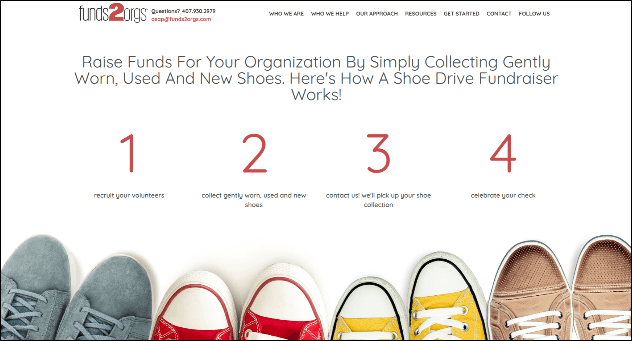 By combining online giving and shoe drives, Funds2Orgs adds an easy and innovative twist to online fundraising. Funds2Orgs makes it easy to collect donations by collecting used shoes. Through this online donation tool, you’ll be able collect gently used and new shoes to turn in for a profit! All you have to do is call Funds2Orgs when you’re ready to host a shoe drive. You’ll collect all your shoes, Funds2Orgs will come collect them, and you’ll receive your donation check in 2 business days. Funds2Orgs donates the shoes you collect to micro-entrepreneurs in developing countries, which means as you’re raising money to further your cause you’re helping other individuals in need, too! There are no out-of-pocket fees with the online donation tools from Funds2Orgs! You simply collect your shoes, turn them in, and walk away with your check. Funds2Orgs is an easy way to raise money for your cause through online donation tools without asking your donors for money. Learn more about starting a Funds2Orgs campaign today! 360MatchPro is a great enhancement to any standard donation software. 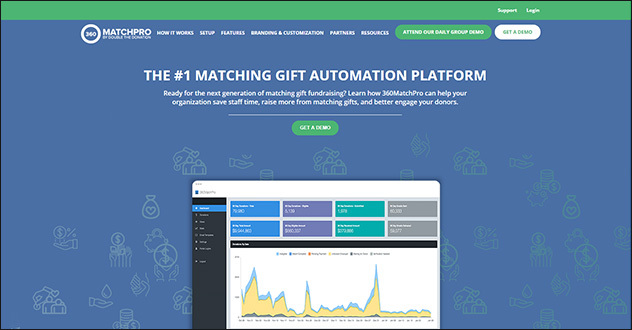 360MatchPro is an automated matching gift software that can track your match-eligible donors and automatically send them materials to market your matching gift program. 360MatchPro is a powerful partner for online donation tools because it provides all the marketing materials you need for your matching gifts fundraising. You’ll drastically increase your gift size through the best use of these matching gifts opportunities! 360MatchPro forecasts your potential increases in donations from eligible donors, leading to more targeted marketing and better financial planning. 360MatchPro uses the email domains of your donors to identify donor eligibility for matching gifts. With the automated email communication features offered through 360 MatchPro, you can reach out to those donors and inform them of their eligibility. Contact 360 MatchPro for a quote today! 360 MatchPro is a great way to forecast, track, and increase your donation amounts. Learn more about 360Match Pro! Finding the perfect online donation platform depends heavily on your needs and goals as an individual or organization. Your software should set you up with all the tools you need to successfully collect donations online and meet your fundraising goals. Peer-to-Peer Fundraising Guide. If you want to learn more about peer-to-peer fundraising, check out our comprehensive guide. Text-to-Give vs Text-to-Donate Guide. Text Fundraising is a unique and convenient way to raise money during events and all other sorts of fundraising occasions. Learn platform is right for you in our complete guide. Donation Receipts. No matter how you collect donations online, it’s important to give donors receipts so that they can claim deductions on their tax returns. We answer 6 common donation receipt questions in this article.